The local man who went missing after diving into the waters off the coast of N. Manadhoo this Wednesday has been safely rescued. 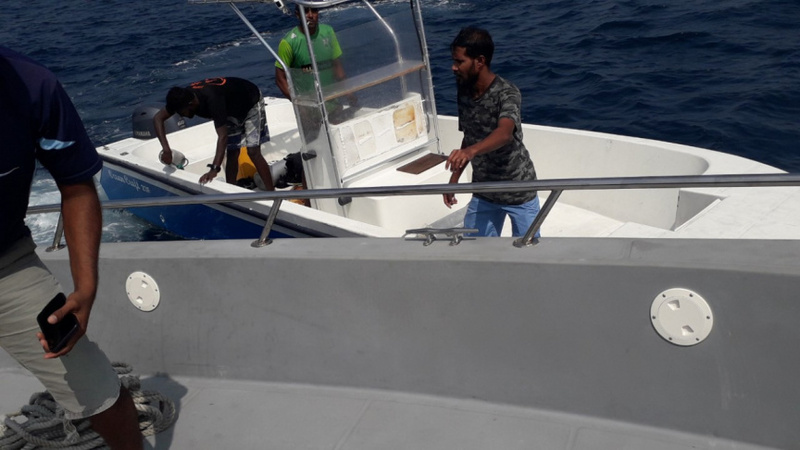 Abdulla Shamin, 24, from N. Milandhoo, was one of the two men on board the ‘Malak Melody’ who dove into the waters to the South of Milandhoo in search of sea cucumbers. Shamin was reported missing to the Coastguard at 12:14 pm. He was found by a Milandhoo dinghy at 13:14 pm amid a search and rescue operation by the Coastguard. The Coastguard reports he was found safely, with no injuries. Shamin was reported missing mere hours after the Coastguard launched a search and rescue operation to find a man who went missing under similar circumstances off the coast of R. Vandhoo. Abdulla Adam, 32, from Fehihiyaage, R. Dharavandhoo, was found in the uninhabited island, R. Dhikkurendhoo, and his being transported to Dhuvaafaru.